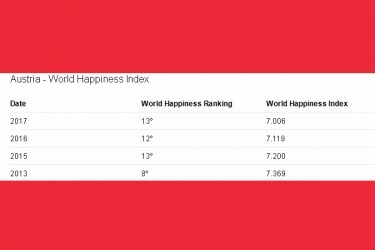 In this year's World Happiness Report, published annually by the United Nations Sustainable Development Solutions Network, Austria comes in 12th place, one place better than a year ago. Finland is the happiest country in the world, but the other Scandinavian countries are also in the lead. The World Happiness Report is an annual publication of the United Nations Sustainable Development Solutions Network that contains rankings of national happiness and analysis of the data from various perspectives. As per 2018 Happiness Index, Finland is the most happiest country in the world. Norway, Denmark, Iceland and Switzerland holds the next top positions. This article includes a total of 337 words.